The quest for a greater understanding of purpose and meaning is universal to our collective existence. We wrestle with the anxiety and uncertainty we all face when we leave behind the known for the unknown. The searing border sunlight forces a pause in this transitory moment. Regardless of the demarcation lines of country and culture, we are all migrants in search of something profound and meaningful to our being. Estamos Buscando A is a multi-faceted series that explores and contemplates the migrant experience in Mexico along the U.S. – Mexico border through various practices, including site-specific public art installation, a gallery installation as well as a migrant guide photo book, spanning a period of 15 year from 2002 – 2017. Between 2002 and 2004, the series started as a site-specific, public art installation with intimate photographic portraits of migrants waiting to cross. The portraits were printed on large-scale steel plates which were then installed on the border wall at the locations where the photographs had been made in Tijuana between the Pacific Ocean and the San Ysidro Port of Entry. By permanently affixing the steel plate photographs to the border wall in Mexico, the retablos served not only as signs of respect and as a homage to those photographed, but also as spiritual signs for other migrants who would come upon them while making their own enduring journeys. A total of eleven plates were installed at five locations. As the number of migrants attempting to cross rose significantly in the mid-2000’s, the series was expanded upon into the Sonoran Desert along the border with Arizona as well as along the Rio Grande. The same collaborative process was used, however, as printing on steel with such a larger volume of photographs was no longer feasible, the entire series of negatives was scanned and digitally printed with archival inkjet pigments on aluminum as a reference to the look of the original site-specific steel plates. In 2005, sections of the original border wall that had been constructed in the mid-1990’s were salvaged with the demolition and rebuilding of the wall at Friendship Park / El Parque de la Amistad at Border Field State Park between Tijuana, Mexico and San Ysidro, California. 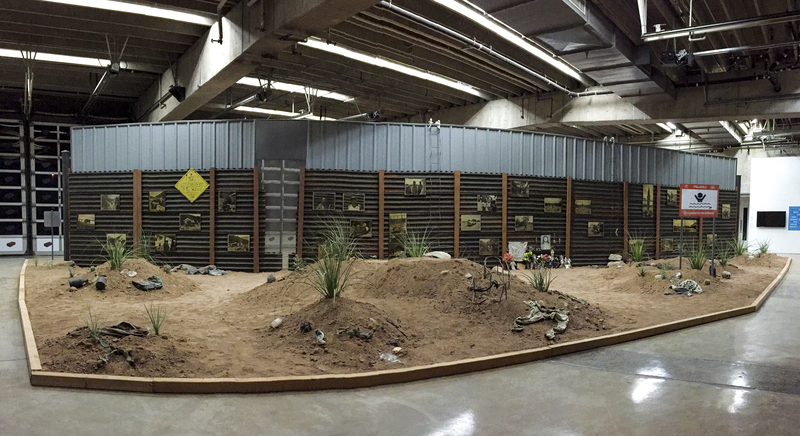 These salvaged sections of the border wall have since been adapted for a large scale, immersive gallery installation with the constructing of a 12 foot high x 64 foot long, free-standing border wall, including both sides of the border experience with dirt and rocks, various ephemeral objects of the migrant experience and a series of aluminum-plate photographic portraits of migrants and the border landscape. In 2016, Estamos Buscando A was self-published as a migrant guide photo book, which navigates a personal exploration into the migrant experience along the U.S. – Mexico border region with a series of intimate portraits, landscape photographs, illustrations, maps, advisories and personal narratives. The book was designed to reference the migrant safety guides that are given to migrants by Grupos Beta and the Instituto Nacional de Migración of the Mexican government. Estamos Buscando A was shortlisted and a runner-up for the 2016 Paris Photo – Aperture Foundation First PhotoBook Award, and was included on the New York Times – The Best Photo Books of 2016 as well as The Best Books of 2016 by Ivorypress and the Humble Arts Foundation – the 17 Best Socially Concerned Photobooks of 2016. In addition to the full-scale border wall installation, various sized fragments of the original wall that had been installed in Tijuana and Mexicali have been collected for smaller wall presentations. Selections of these border wall fragments were recently included in the Transborder Biennial 2018 / Bienal Transfronteriza 2018 at the El Paso Museum of Art in El Paso, Texas and the Museo de Arte de Ciudad Juárez, Chihuahua, Mexico. San Diego-based American Paul Turounet is another artist who uses the medium of photography to capture the transience of life at the periphery, and more so than the previously mentioned artists, centers his vision on the stories that unfold before The Wall. Interestingly enough, in works like Estamos Buscando A, he attempts to transcend the limitations of the medium by going beyond the flatness of the photograph and presenting the spectator with an entire mileu to contextualize the images, one that is less observed than inhabited. The most dramatic of the exhibitions, Estamos Buscando A (We’re Looking For) by Paul Turounet, an artist celebrated for his haunting photos of migrants, is a giant installation occupying the massive Great Hall. It’s nothing less than a re-creation of our militarized border. 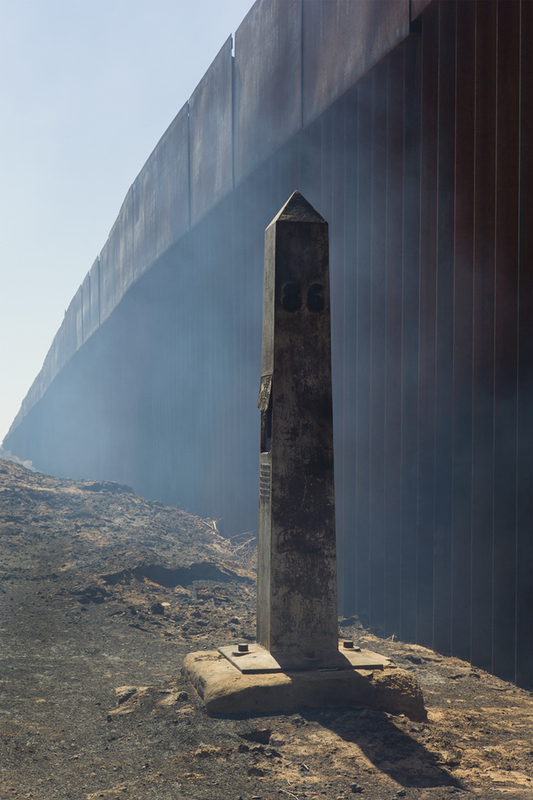 A salvaged slice of actual border wall zooms 64 feet from one end of the gallery to the other, dividing the space into the U.S. on the north, and Mexico on the south. 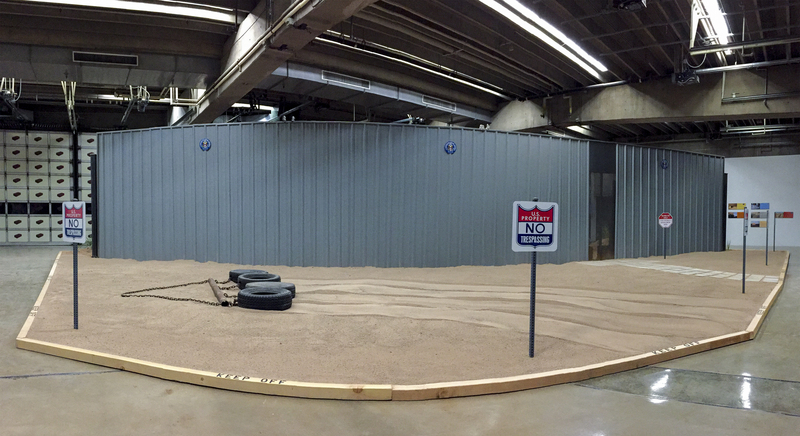 The wall is about 12 feet high, a mere fraction of the height of the president’s proposed new wall, and it’s planted on 3,000 square feet of dirt covering the gallery floor. The northern side of the structure is forbidding and authoritarian. Based on Trump’s design protocols, it “foretells the future of isolation and detached nationalism,” Turounet says. The wall is an impassible stretch of pale metal. Nine “Keep Off” signs are painted on a curb; another sign warns of a “high intensity enforcement area.” What seems to be a door in the wall is really a wire cage. There are no humans to be seen. The faces of people who might have left these things behind are fixed to a corrugated metal wall (ironically, another real-life discard, tossed out by the Border Patrol when a new wall went up a decade ago). Turounet has printed the travelers’ weary faces in sepia on shiny aluminum, making them gleam like retablos, the Mexican folk paintings on tin that record miracles. But these gorgeously made pieces don’t show any rescuing saints: instead they grieve for the wretched of the earth. In one heartbreaking photo, a confused small girl rides in a truck crowded with migrants; she looks at the photographer, trying to puzzle out what’s going on. Many of the photos portray exhausted men at makeshift camps they’ve constructed by the wall, complete with bedrolls and grills for cooking. One man lies prone on a pillow, barely able to open his eyes; it’s an image that seems to foretell his death. And a flower-laden shrine, so common on the migrant trail, is mourning a life already lost: propped against the wall are family photos of a smiling man, first as a groom with his bride in happier times, and then as a father with his young son. Estamos Buscando A (We’re Looking For) is an account of the human cost of the various impediments — walls, fences and natural features — along the Mexico-United States border. In this sense, it is similar to Misrach’s “Border Cantos.” But Turounet’s little book shows things largely from the Mexican side, mostly in Sonora, which borders Arizona. It features a number of portraits of migrants or would-be migrants and written accounts of what the photographer himself saw over many years of studying their crossings. The book, with text in Spanish and English, is ingeniously put together in the form of a guidebook, the kind of thing an NGO or government might issue to people thinking of walking across. The text warns them not to do it, counseling them, instead, to seek legal means of entry. But, wise to human obstinacy and desperation, it also offers them advice on how to proceed if they must, whom to avoid, how to prevent heat stroke and so on. Alongside Turounet’s photographs are a number of illustrations by Tim Schafer. It all makes for an unforgettable act of witness in a compact package.